I am appreciating elements of the Innovator’s Mindset MOOC (IMMOOC) just fine.I’m mid-way through the book. I’ve read a lot of blog posts, added comments to spark my own thinking, and tried my hand at some various collaborative efforts. Some of those collaborations have drawn some interest; Others, not so much. Our goal through this process was to really tap into how we can “empower” you through this process, not simply engage. What are your thoughts on this? Would love to hear what you think. How we participants engage in the IMMOOC … that’s the key. Just as one central message among blog posts and weekly Hangouts is that teachers need to be innovative in order to help students become innovative, MOOCs have to be innovative if they want educators to become innovative so their students become innovative. If I add another layer — school administrators (and there are lots of them in the IMMOOC) — into that mix, the loop might leap right off the page. In hopes of sparking some possibilities, then, I offer up some suggestions for moving the IMMOOC towards more a potentially innovative experience. I have appreciated the weekend Hangout Sessions, particularly later on as I listen and annotate in Vialogues, but it has felt a bit like we’re replicating the old model of teachers (George and Katie) talking to a room of students (us). They talk (with guests they line up and with include questions from the community) and we listen. What about if they openly invited about six to eight IMMOOC participants into the Hangout, and let those folks talk. 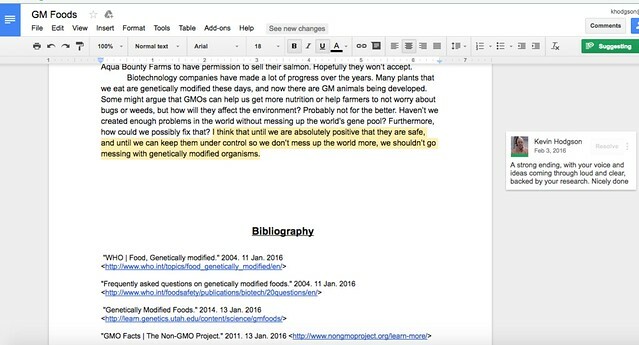 Put out an open Google Doc. Let folks invite themselves to be guests. Maybe crowdsource themes. Discuss. Look to Teachers Teaching Teachers as a model. Or the Make with Me sessions in Connected Learning MOOC (which I was part of). Allow participants to be the center and the voice of the experience. What about if Writer George and Publisher Dave put an entire chapter of his book, Innovator’s Mindset, online, and we were all invited to annotate it, using Hypothesis. A rich conversation could unfold in the margins, as we celebrated and pushed back on ideas around innovation. The conversation could drift from George to the community (with George and Katie in the margins, too … wouldn’t it be neat to ask George questions about lines and passages in the text, with the text as the text and the author as participant?). How about if we created short interactives using the site Answer Garden. 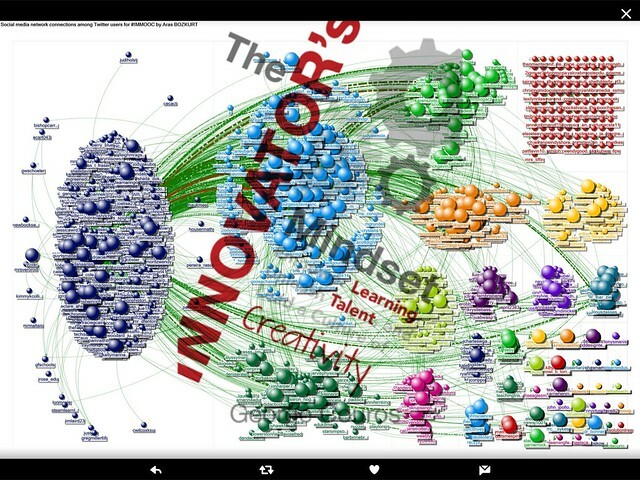 We could feature two interactive word gardens with two opposite questions: “Innovation looks like …” and “Innovation does NOT look like …” and our responses would be pulled together into one visual Word Cloud experience? It would draw us together. Could we create a Padlet where folks could share their best practices in innovation? I know many are doing this on their blogs (which can be hard to find) and on Twitter (where sharing comes and goes). We could collaboratively create one central resource, built over time, would be valuable to all of us, and into the future. It could live on beyond the IMMOOC. People could just share links to blog posts, so the work involved would not be too much. It would be a gift from us to us to others. Is there any way to consider an innovative culminating event for the IMMOOC? (Note: George and Katie may already have this in mind.) Could we collaboratively write a shared post about the experience, with a nod to where we all go from here and how we help others along the way? (It could start in Google Docs and flow to a blog post at the main site). Again, this is not criticism for what has been happening so far. Obviously, people are engaged. Some people are writing their first blog post ever. Others are trying new things. George and Katie probably have their hands full. This would not have to fall on them to do. Real MOOCs don’t rely on the facilitators. Real MOOCs rely on the participants. WE could all do it. YOU could do some of it. It would be a SHARED adventure. It seems to me that the theme of “innovative practice” should be represented in a learning space that calls itself the Innovator’s Mindset. Let’s harness the digital tools for collaboration so that we all learn and move ahead together. 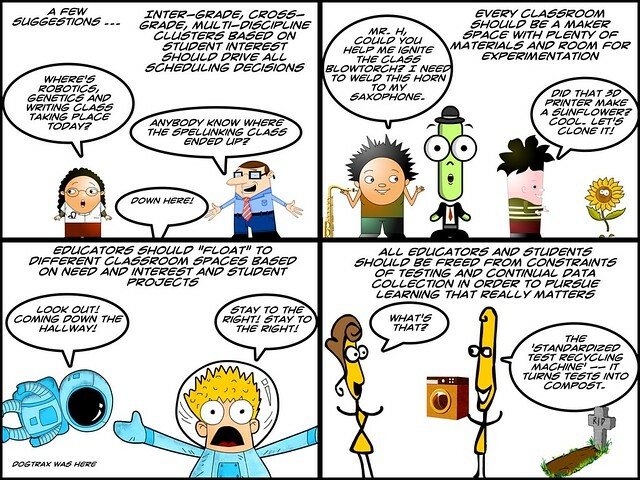 This is a comic I created for the Innovator’s Mindset MOOC. There was a call to wonder about how we might change the ways schools work or how learning might happen. To be honest, I can’t remember the original call to action.